← News Alert ~ Can You Help Garry & Sarah ‘Make Their Day’? 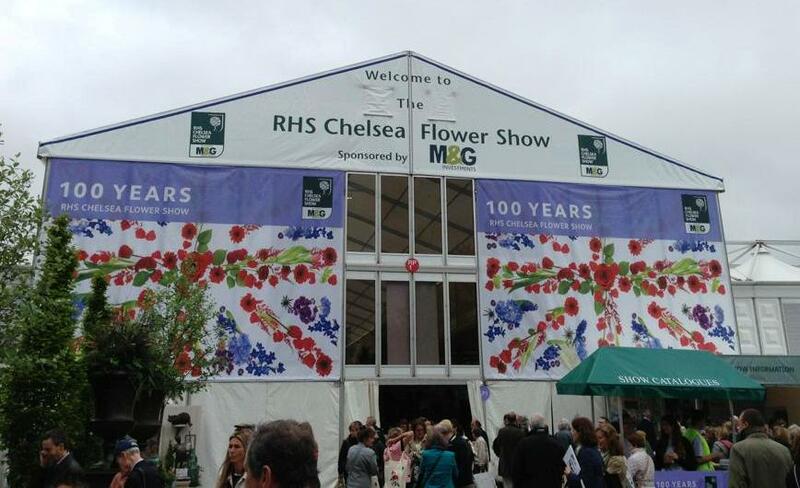 On Monday 20th May I was lucky enough to attend my first ever RHS Chelsea Flower Show with the lovely Emma Newman owner of Signature Flowers by Emma Newman. Emma was a Finalist in the Young Florist of the Year 2013 and I had so much fun exploring the show with her. She has put together an account of her week together with some inspiring images for Wedding Flowers for your special Day… it’s over to Emma. Back in November 2012 I qualified for the Young Florist of the Year Finals at this years RHS Chelsea Flower Show. From over 400 competitors at all the regional heats I made it to the final 16 in the UK. To create a never ending circle which related to someone or something to do with the Flower Show over the last 100 years. I chose a design which reflected the ceremonial dress of the Chelsea Pensioners and McBean’s Orchids – a company who have exhibited at every show since it opened in 1913. I used 2 different coloured orchids alongside lots of flower materials with heavy textures including the seedpods of scabious and bright yellow Craspedia balls. As well as this I used techniques including graduating of tanacetum heads and rolling of beautiful soft statchys leaves. I created upon a frame kindly donated by Premier Joinery of Quainton – a big thank you to the team up there who turned it from a florists scribble into the real thing in under 24 hours. Upon getting it home the mammoth task of filling it with kebab sticks began … at this point I have to thank the entire family for their support as I wouldn’t have done it without them! Finally the actual floristry could commence, I cut and glued for around 4 hours on Saturday evening and again Sunday morning before we loaded the van to go. On arrival you could hear a pin drop as competitors and their assistants arrived – the atmosphere was very tense in the two hours we had to stage and complete our designs. Some finished to the standard they wanted, others would have liked more time despite having already stunning designs on show. Monday was press day and to pass the time and calm the nerves I went off looking at the gardens with Sue from IceTheCake.co.uk. It was so nice to have a familiar face at the show as although I knew one of the other competitors really well we all needed to be focusing on other things that day! Sue and I saw some stunning sculptures, amazing gardens and even a dress made completely from flowers designed by the incredible Zita Elze. Sue loved Cath Kidston’s lawnmower, I loved the paint effect on the grass – it was beautiful! Everywhere we looked there was something we hadn’t noticed before! We also found time for a bit of celebrity spotting, although Sue is better at recognising voices than faces!! Later on after Sue left some of the other competitors and I enjoyed watching members of the Royal Family arrive. Tuesday morning was results time … and as several of you may have seen, it was live on the BBC – never have I been so terrified in my life. The standard was so high this year, unfortunately I was one of 6 who didn’t get awarded a medal but I have learnt so much from the experience. I met some great individuals, competed against the 15 other incredible young florists from the UK and gained lots of inspiration for another year, perhaps! It was an emotional day – more so than expected possibly, but when you put so much time and effort into a project what do you expect? Fortunately Julia from Robin’s Flowers was there to explore more of the show with and introduce me to all the ladies from NAFA’s the National Association of Flower Arrangers. Later that evening I met up with one of my bride’s for later in the year! The flowers that really stood out included big strong flowers like Amarilyis and Alliums, alongside the more oriental Orchids, of every variety. I think the choices will be about the flowers that brides really love, as opposed to a trend as such, having something that makes your wedding stand out from others. Vintage and Cottage Garden was still very prolific in the gardens and I imagine it will be set to continue throughout 2013. Thank you to everyone for your support, late night messages checking I was okay and continuous kind words, they got me through a tough few days!